19 year-old Hannah Ward has given up most of her childhood in pursuit of her dreams... a spot in the corps de ballet of the famous Manhattan Ballet Company. As a very worldly teenager, she's already been living in Manhattan for several years, and is slowly but surely attempting to work her way to the top of the heap in her clique-ish, exclusive world. When I first heard about this book, I thought for certain it would be some kind of exploration of body issues, and maybe an anorexia book with touches of evil competitiveness a lá Black Swan. That is the stereotype of the hard-driving, ambitious, slightly-crazy ballerina, right? I was pleased that the book dispels those ideas immediately. Hannah's not anorexic - she's always been naturally slim. It's just her natural body type. She eats healthy, but "cheats" every now and then with a big bowl of pasta or (thanks to lax city bartenders) the occasional glass of wine. She doesn't hate her fellow dancers - they are her best friends and constant companions. She doesn't even consider herself a true "ballerina." She's a ballet dancer, but she's not a star. For her, it's a living. Flack's own experience as a dancer lends lots of realistic details to the book. Hannah and her friends are heartily sick of The Nutcracker, a perennial audience favorite which is physically challenging yet artistically boring. They are tired of having to dance through filthy re-used plastic snow every night, which then wends it's way into everything: hair, clothes, even the utensil drawer at home ends up with stray bits of dirty white fluff. Another detail I didn't expect, but found completely believable was the staff of professional masseuses and sports doctors on hand to treat the ballet dancers - massaging them into shape, even offering an ultrasound machine in the basement, where dancers are invited to wand their tired bones back into fighting form again. When Hannah meets Jacob, a gorgeous college-student musician, they are both instantly equally smitten. Hannah soon realizes just how all-encompassing her schedule really is as she struggles to make time for him. I loved how from her perspective, she sees Jacob, "all the time" - bending over backwards to call in favors and skipping classes in order to get in a simple date. From Jacob's perspective, he almost never sees Hannah. He likes her a lot... and he'll wait patiently for her, but even so, a man has his limits. In fact, Hannah is only seeing Jacob every couple of months - to her, with a jam-packed routine where every moment is either devoted to rehearsals, auditions, performances or classes, it really does seem like time flies. 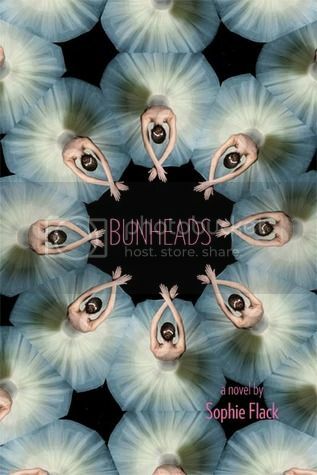 It would be so much easier to continue to ensconce herself in the world of the "bunheads" - the serious ballet dancers, and date the charming son of one of the ballet company's most generous benefactors. As Hannah puts on a little weight, she's mortified to have to wear a bra for the first time. A few critical comments from her dance director leave her feeling shaky and unsure of herself. Again, I liked how this is a brief crisis of conscience, rather than an all-encompassing quest for her. I thought Hannah's main struggle was in how her ballet colleagues - who have been her entire universe - will most certainly judge her if she chooses to dial back on what is already a short-lived career for "some boy." Ultimately, Hannah has to do what feels right for her, and I liked being inside her head as she thoughtfully considers her options. Romantic, funny and totally absorbing, I loved this look into the life of a dancer who struggles with "work/life balance," on a grand scale. I highly recommend this book.